An RV road trip can be exciting, but it can also lead to disaster if we don’t take steps to stay alert while driving. According to the National Highway Transportation Safety Administration, an estimated eighty-three-thousand drowsy driving related crashes occurred in America between 2005 and 2009. In 2014 alone, eight hundred forty-six deaths were caused by drowsy driving! 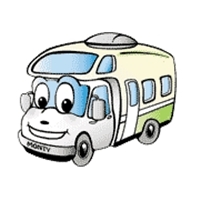 RV travel can be a safe and enjoyable experience if we know how to stay alert while driving on RV road trips. Use these ten tips to keep your RV between the lines on your next journey. 1. Set a Realistic Schedule: You may be tempted to rush the long drive to arrive at your destination sooner. Setting a realistic schedule for your trip is the first step to staying alert while driving. A sixteen-hour drive may sound doable, but that’s two full work days’ worth of driving! If getting there quickly is a must, see below for ways to stay alert while keeping to your schedule. 2. Get Good Rest Before You Go: If you’re a last-minute packer, you’re probably loading the RV at midnight the night before you leave. It also means you’re missing sleep before driving long distances. Try to get to bed early and get a good night’s sleep so you’ll be alert and refreshed for your drive. 3. Admit Your Limits: This one’s related to tip number one, but it’s a little more personal. It may be hard to admit when you hit the wall of exhaustion, but throwing in the towel instead of ‘toughing it out’ could make the difference between a memorable journey and tragedy. 4. Know Your Warning Signs: Do you know the signs that you’re too tired to drive? For most people, it’s blinking or yawning excessively, having trouble focusing on traffic, an increasing temptation to close your eyes “just for a second” or beginning to swerve to the shoulder or outside your lane of traffic. By the time these signals appear, you may already be in danger of causing an accident. 5. Set a Schedule for Trading Drivers: If more than one person is a licensed driver with experience driving an RV, set a schedule for trading off driving duties. Every two to three hours is a good timeframe. 6. Take a Stretch Break: If you’re the sole driver, exercise executive privilege and take stretch breaks when you need them. You may get some grumbling about stopping too often, but your first responsibility is to get everyone to your destination safely. Roadside rest areas are ideal for getting out of the vehicle, taking in some fresh air and stretching those road-weary muscles. Take a quick inventory before you get back on the road; if you’re still too drowsy, it’s time to stop and rest. 7. Try Caffeine: Caffeine can increase alertness, so drinking coffee, tea or a caffeinated soda can help. Keep in mind that at some point you’ll feel the ‘caffeine crash’ when the effect drops off. 8. Exercise to Increase Alertness: If you’re in a place where it’s safe to move around outside your vehicle, try a few minutes of cardio—jogging in place, jumping jacks, anything to increase blood flow and break the monotony of sitting behind the wheel for hours. 9. Find a Safe Place to Take a Nap: If you’re far from your destination campground and can no longer drive safely, have someone use the All Stays app to find a Walmart or truck stop that allows you to park and sleep a few hours. It could be a life-saving decision. 10. Go to Plan B: There comes a time, thanks to weather delays, poor planning, road construction and other obstacles to reaching your destination, that it’s time to change your plans to fit reality. Going to Plan B might mean deciding you’ll slow down your pace and not spend as many days at your destination. It could mean finding a campground to spend the night instead of pushing through. Maybe it means exploring attractions along the way and stretching out your trip to allow you to drive more rested. It might be disappointing, but deciding to flex your RV vacation rather than driving while exhausted is always the better plan. RV travel to America’s beautiful places can provide some of life’s best moments. Keep your RV trips safe and sane by using these ten tips for staying alert on the road. This entry was posted in RV Travel Tips. Bookmark the permalink.